Tasty Gluten Free Crumble. Enjoy this easy gluten free dessert. 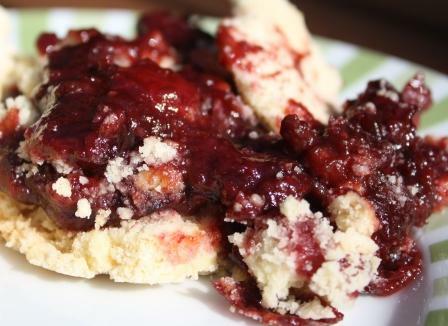 Gluten free crumble is one of the easiest gluten free desserts to make. Tasty and simple, this is a gluten free recipe everyone can make so is ideal for experienced gluten free cooks and first timers. a nutty version inspired by Andrea Robson's suggestion below and adapted from a recipe in the wonderful Country Living Magazine. As with all recipes whether gluten free or not it is the quality of the ingredients that will make the difference. We use fresh seasonal fruits from our garden. This recipe gives you options for two of our favourites, plum crumble and apple and blackberry crumble. 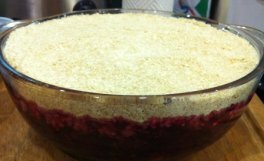 Other favourites include apple, cinnamon and sultana crumble..
Gluten free crumbles, like "normal" crumbles are not only versatile in terms of the number of fillings you can use but also in terms of preparation. I often freeze the stewed the fruit when it is available and then defrost it when I need it. You can also make your gluten free crumble topping up to a day in advance and store it in a sealed container in the fridge. Have both topping and filling at room temperature when you put them together and into your pre-heated oven. This recipe gives quantities for 6 people. 4oz (100g) sugar (I use soft brown sugar but any will do). For the plum crumble, wash, halve and de-stone the plums. You do not need to remove the skins. For the apple and blackberry crumble, use a mix of cooking apples and blackberries. Peel, core and slice the apples and wash the blackberries. Pre-heat oven to 350 F, 180C, gas mark 4. Place the sliced apples, blackberries, sugar and water in a saucepan. Cook gently until the fruit is soft, adding more water if required. Taste towards the end of cooking and add more sugar if preferred. Make the crumble by rubbing the butter into the flour until it resembles fine breadcrumbs. Stir in the brown sugar, ensuring well mixed. If you are making the nutty alternative crumble topping. Roughly grind the hazelnuts either using a food processor or by placing them in a plastic bag and bashing them with a rolling pin. Place the flour and ground almonds in a bowl and rub in the butter until it resembles breadcrumbs. Stir in the brown sugar and hazelnuts, ensuring well mixed. Place the cooked fruit into a pie dish and spread the crumble mixture on top. Use a spoon or fork to spread it evenly over the top, pat it down lightly. Cook for 30-40 minutes until the top is slightly brown. Serve hot with cream, ice cream or crème fraiche.